Just a few weeks ago, astronomers made a huge discover: a gigantic galaxy circling our own appeared seemingly out of nowhere. And now Hubble has discovered a new moon roaming in plain sight at the borders of our very own Solar System. Astronomers discovered this moon circling the second brightest icy dwarf planet, Makemake, way past Pluto in the Kuiper belt, and it's about 161 km (100 miles) in diameter. So what took us so long to discover this significant object in our own cosmic backyard? The main reason is darkness. Yes, the newly spotted moon, which has been momentarily called 'S/2015 (136472) 1', was able to stay hidden from us for so long because it's extremely dark. This particular moon returns such a minute amount of light that astronomers have struggled to see it next to the brightness of Makemake. S/2015 (136472) 1 or 'MK 2' for short, is more than 1,300 times dimmer than its host planet. 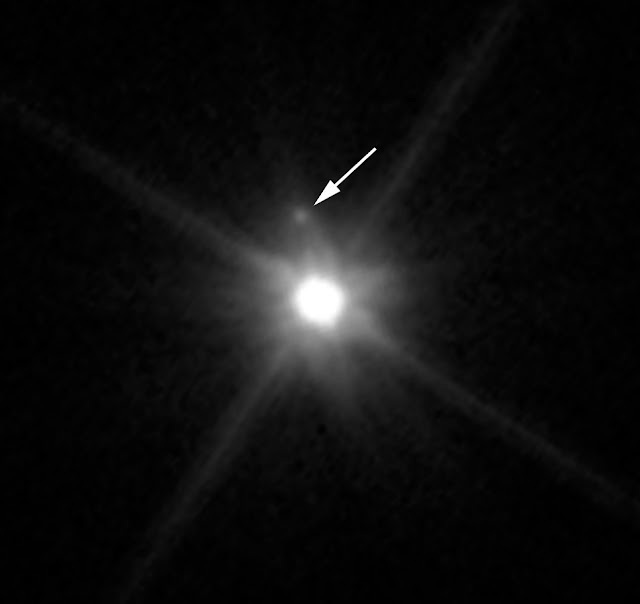 Astronomers decided to target the Hubble Space Telescope at Makemake for over two hours back in April, 2015 and after that the moon finally revealed itself. Alex Parker, an astronomer from the Southwest Research Institute in Texas, was reviewing the data obtained, he discovered a faint point of light moving about Makemake nealry 20,900 km (13,000 miles) away. You can view that tiny point of light in the Hubble images above. Parker told National Geographic “I was sure someone had seen it already” He enquired his fellow astronomer Marc Buie about it, who replied with: "There's a moon in the Makemake data?" "It was at that point that everything got exciting and kicked into high gear” said Parker. The astronomers now desire to use Hubble Space Telescope for additional study and to figure out the exact orbit of MK2 in the hopes of knowing more about the structure and density of the icy dwarf planet. The study has been put forward for peer review, and is issued on the pre-print site arXiv.org so others astronomers and experts can also add their thoughts. It's quite thrilling to know that there's still much out there in space that we haven't discovered as yet. Who knows, this might also be the year we finally spot the Planet Nine.